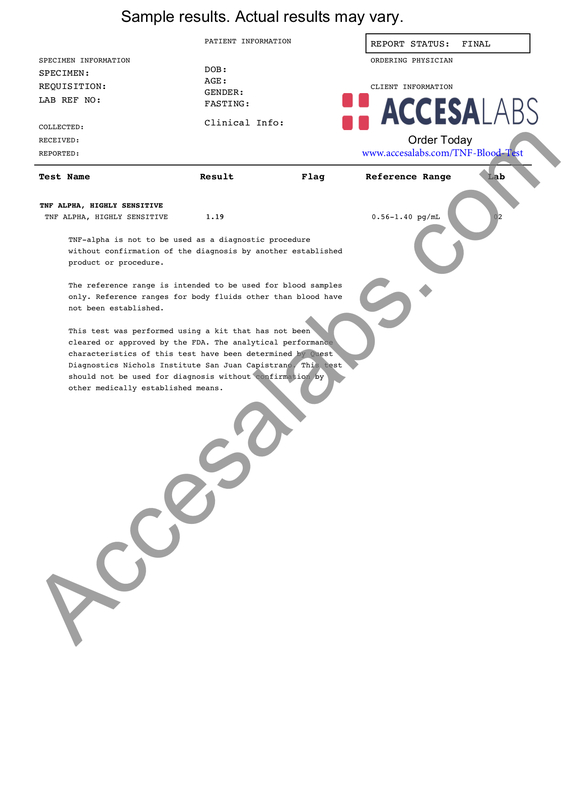 The TNF blood test checks the TNF-alpha (TNF-a) blood level. What is an TNF alpha test? The TNF blood test measures the TNF alpha blood level. Why is a TNF alpha test important? The TNF alpha blood test helps evaluate the cytokine profile in the body. This TNF Alpha Test is a blood test. The TNF-alpha test, also known as a TNF blood test, TNF alpha test, and a tumor necrosis factor test, measures the TNF alpha blood level. TNF alpha, also known as tumor necrosis factor alpha, is a type of cytokine. Cytokines are special types of proteins that are involved with a cell communication process known as cell signaling. Sometimes known as cachexin or cachectin, TNF alpha is turned on by cells in the immune system called macrophages. As a cytokine, the TNF alpha test is sometimes performed at the same time as the interferon-alpha test, interleukin-1 test, interleukin-2 test, and the interleukin-6 test. TNF alpha is part of the acute phase inflammatory response in the body. and can cause fever and cell death as part of its role in protecting the body from viruses and tumors. When the production and metabolism of TNF malfunctions, abnormal TNF blood levels can lead to a variety of inflammatory conditions, including Alzheimer's, psoriasis, mood disorders, cancer and inflammatory bowel disease (IBD). To get a TNF alpha blood test near you, simply order online and get your blood drawn at your selected Quest Diagnostics lab. Your TNF lab results will be available electronically and you will be notified when they are available. Please note that this TNF-alpha test was performed using a kit that has not been cleared or approved by the FDA. The analytical performance characteristics of this TNF blood test have been determined by Quest Diagnostics. This tumor necrosis factor test should not be used for diagnosis without confirmation by other medically established means. TNF Alpha Test at Guaranteed Prices.